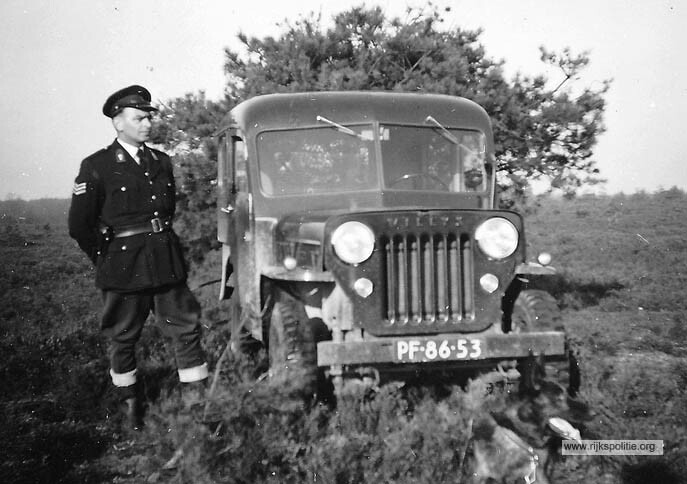 These photos from the archive of Sergeant C.M. 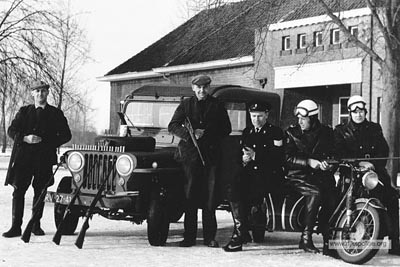 Koning of the former Netherlands State Police, are courtesy of rijkspolitie.org. 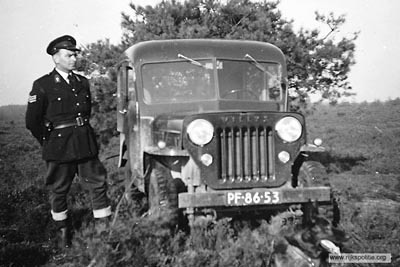 They show the Field Police Detachment patrolling for poachers in the Hoog Soeren area in the late 1950s. 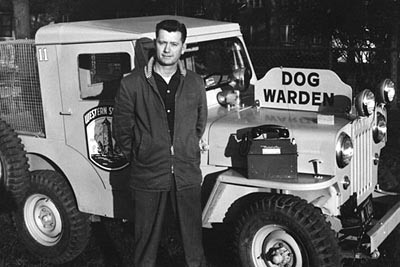 A sergeant with his Jeep and dog, in February 1958. This kind of beautifully-made steel hardtop was common in Sweden, but was seen less often in the Netherlands. In case you didn't think the Veldpolitie meant business, some of the detachment, including Dirk van Veldhuizen (left) posed with what is probably a display of weapons confiscated from poachers. Jan Hogendoorn sent a rear view photo (90K JPEG) that gives a good look at the Dutch-built hardtop on a similar DJ-3A. Jan also took a photo of the same DJ in the Hague in 1985, after its retirement from the Rijkspolitie (150K JPEG). 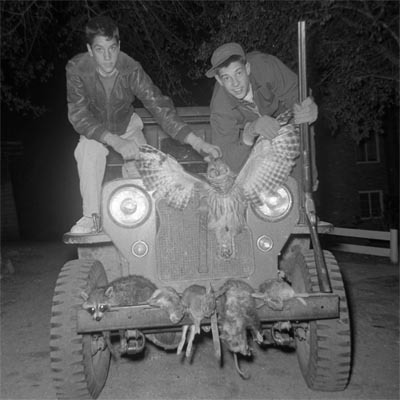 Ken Bushdiecker, well known as "Oldtime" on the CJ-3B Bulletin Board, was always fully compliant with the fish and game laws when he headed out in his 1953 CJ-3B, to which he added a Koenig halfcab from a '61 3B. Ken writes, "Here I am in about 1985 running a mink trapline with my trusty '53. Remember my Christmastime story titled Tracks in the Virgin Snow? Well, there's a pair of those 'Norwegian hiking boots' sitting in the foreground here. As you can see I always like to put the Universal to use in outdoor activities. "Note the rear mounted spotlight that makes reverse in deep dark woods a pleasure. Also a whip CB antenna mounted to the rear rack. That's right... a 3B with a CB! The CB radio is mounted onto the center of the cab's roof. This 3B has correct original marking lamps installed as blinkers on the rear.Too bad the flush mount taillights are not original. The spare wheel is mounted to the rear of the cab inside the short bed. Rear corner bow sockets and the side spare mount were removed." See also our Fall 2007 cover photo showing Ken's '53 with a load of tipi poles (100K JPEG). 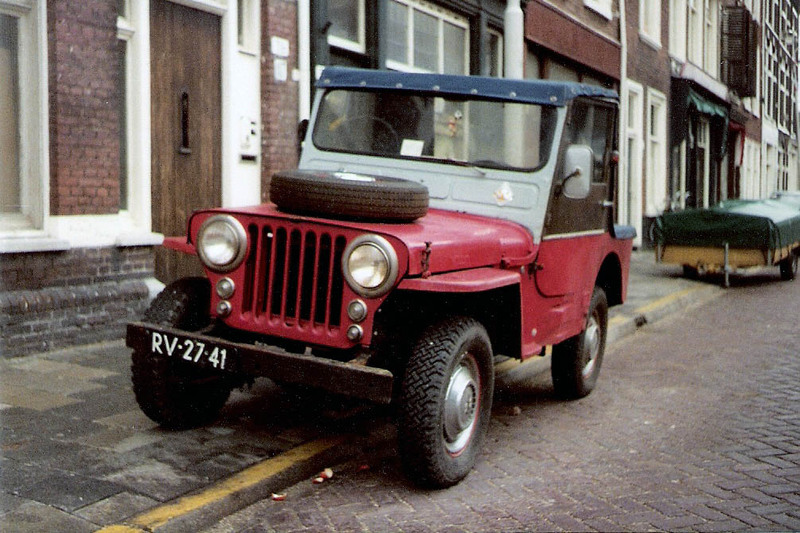 And the story of his orange '64 CJ-3B, An Oldtime Dream from 1964. 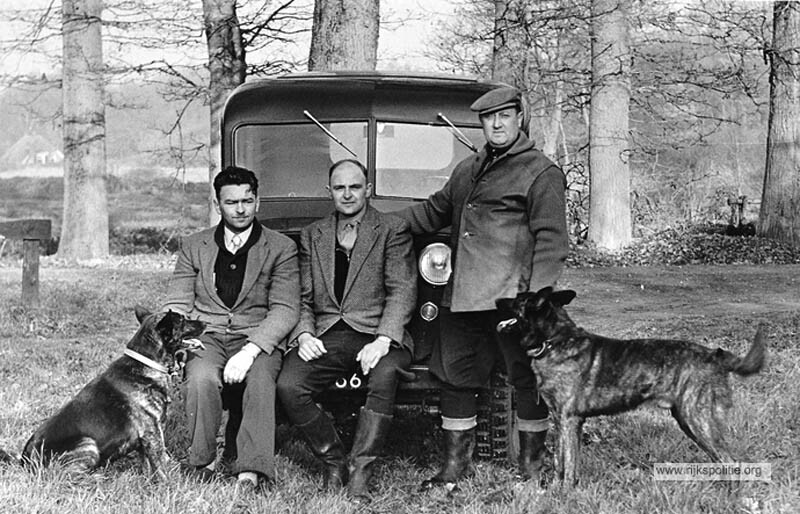 James Patton wasn't quite a man yet when this photo was taken in 1960, but he probably thought this moment was a big step along the way, as he and his brother unloaded a deer he shot. 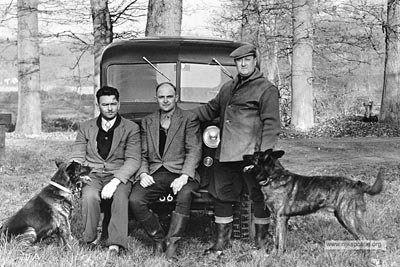 The Jeep was a '54, and is still owned by James. Federico Cavedo found some more hunting photos in the William R. Ferris Collection at the Southern Folklife Collection, University of North Carolina at Chapel Hill. 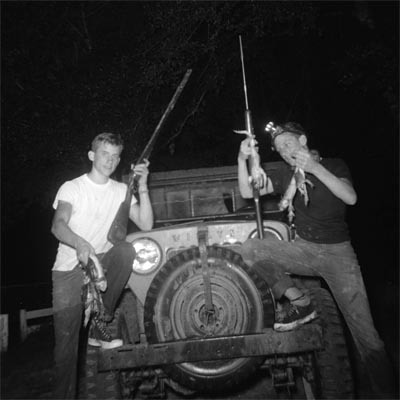 This photo shows the young Bill Ferris (left) and his cousin Bronson Hall posing with shotguns and bullfrogs, in Vicksburg MS, circa 1954. William R. Ferris (born 1942) is the noted author and scholar who co-edited the Encyclopedia of Southern Culture . 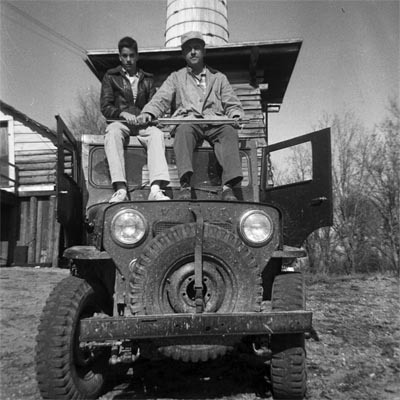 This 1954 photo by Bill Ferris shows his cousin Eugene (Gene) Ferris, and uncle, Eugene Beverly Ferris, posing on the same Jeep. Photograph taken on the Ferris family farm, Vicksburg MS. From the William R. Ferris Collection, Southern Folklife Collection, University of North Carolina at Chapel Hill. 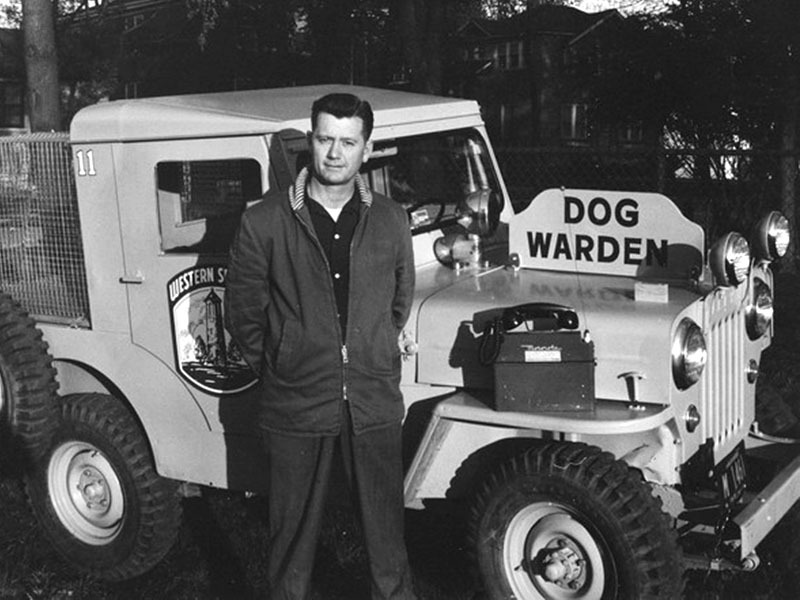 This photo from the Western Springs Historical Society in Illinois shows Bob Addison, one of two off-duty police officers appointed in 1960 to serve as dog wardens to keep stray dogs off the streets. If you prefer Dogs and Jeeps instead of Men and Jeeps, see Hounds and High Hoods on CJ3B.info. This one is a mystery photo spotted by the late Bruce Agan. 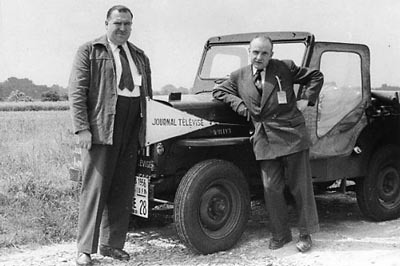 The "Journal Télévisé" pennant suggests this is France, where JT is still the major daily TV news show, and the year 1956 is visible on the sign attached to the front bumper. 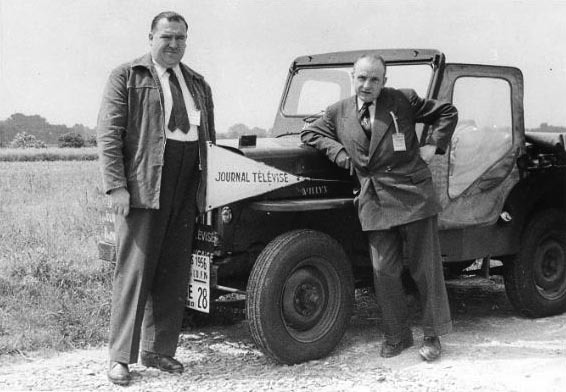 What was the event, and why did the TV newsmen need a Jeep to cover it -- maybe the Tour de France? But when I saw this photo, the first thing I thought of was the next photo below. Almost the same two guys! 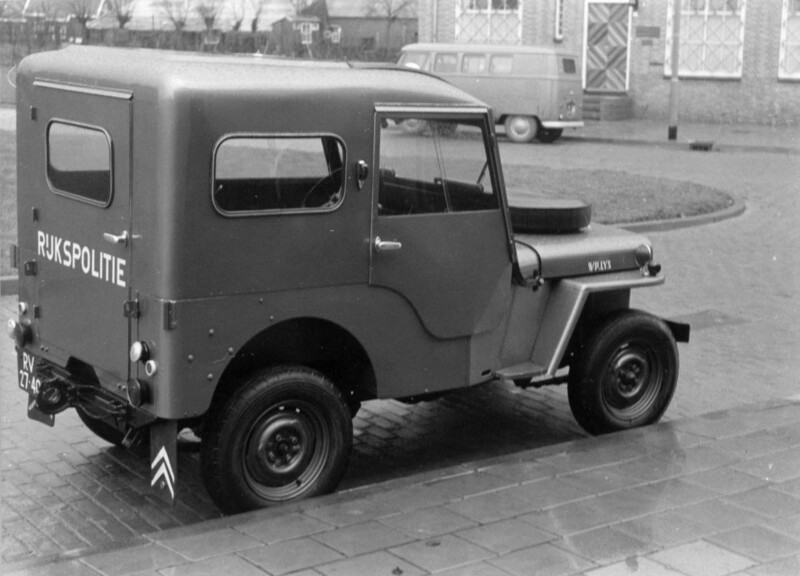 A 1958 photo from Promoting the Australian-Made CJ-3B shows a support vehicle for the 6th Around Australia Mobilgas Trial. Some 14,000 km in length, this was one of the most prestigious of the long-distance rallies which were very popular in the 1950s, and was a good opportunity for Willys Motors Australia to advertise the new Australian-assembled Jeeps. These two gentlemen are apparently mechanics. 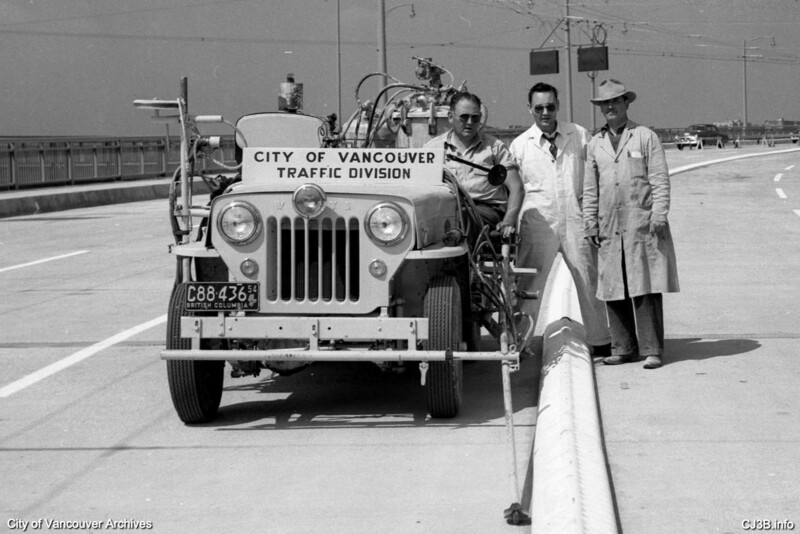 Here's another bunch of guys with a CJ-3B making the roads safer. 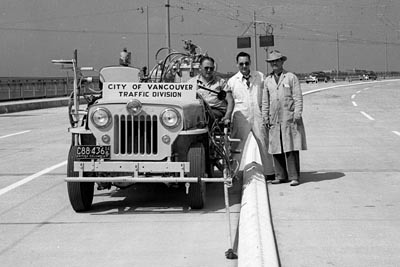 See more details on this Traffic Line Painting Jeep in Vancouver in 1954. This 2007 photo advertising Bathys Hawaii watches shows that a tough guy in front of a high-hood Jeep is still as cool an image as ever. Wearing the watch is the Jeep owner Mr. Bob, who says, "My '54 3B was photographed for an advertisment on the web for Bathys Watches, which are being marketed internationally. The engine was apart when the photo was taken, so I guess beauty, in this case, was only skin deep. 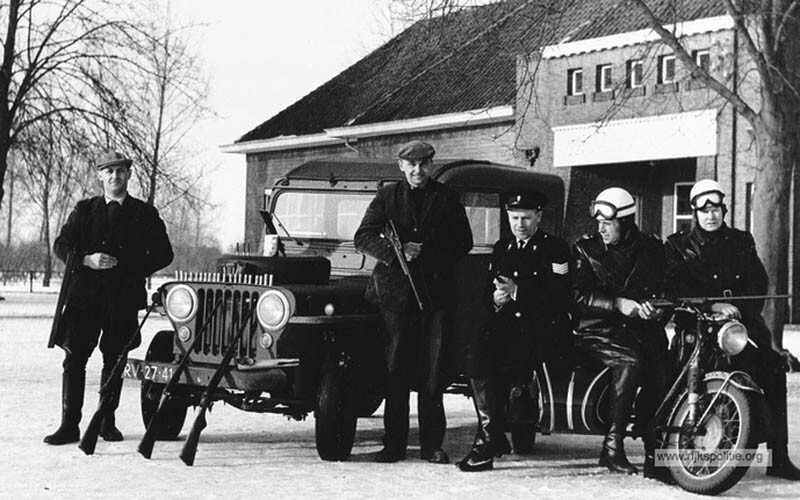 Did not end up with a watch, just the enjoyment of seeing the photographer and his crew fall in love with the Willys. The watches are expensive. I'd rather spend my money on parts for the CJ-3B." Another photo from the Bathys Hawaii website -- this one with a younger dude wearing the watch. Good choice of vehicle by Bathys -- maybe they noticed that the CJ-3B showed up as #29 on Automobile magazine's list of the 100 Coolest Cars of all time. 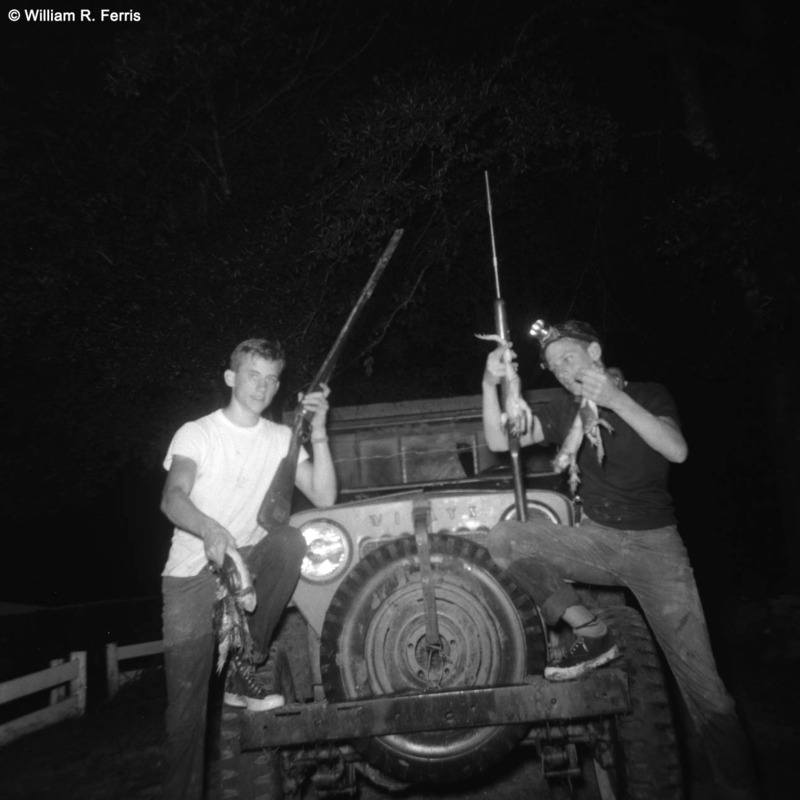 See lots of photos of CJ3B.info readers with their Jeeps, in the Owners and Photos section.